A young boy was walking through town holding a large jar of honey. He didn’t notice the man sitting on the bench watching him. The older man was enjoying watching the boy scoop out the honey with his bare hand and quickly putting it in his mouth before any of the honey spilled. You will never know how great reacting to someone’s content is until you try it for yourself. One cannot understand the reasons behind why another person would perform an action on their content until they have been in their shoes and performed action, too. To create a content marketing strategy that prompts action and engagement, you have to step into the shoes of the reader, understand their predicaments, goals, and know how to give them what they need. Let’s talk about how you can build a content strategy that brings this type of psychological engagement to your blog. Too many people create content simply because it’s Monday and they have it on their schedule to do so. While it’s good to be consistent with your content, are you sure you’re affecting the reader every time you put pen to paper? Granted, the pros know how to create content and it’s always a good idea to dip your finger in someone else’s jar and learn from them because of this knowledge. If you’re not creating content that speaks to someone every time you’re writing, then why are you doing it? If you are unsure, then take a walk around the internet and start reading some of your favorite blogs in your niche. One of my favorites is Demian Farnworth’s. This guy is a word chef and knows what I like for dinner! People like this can show you a lot about creating content that speaks to people. Any content that creates some type of action on the reader’s part could be considered deliverable content. That’s your goal. This is where you want to be, where every writer wants to be, with their career. You’re only looking at it from your perspective. You already know what you want. You want them to sign up to your list, buy your product, or enlist in that free webinar later. But what about the reader? What do they want? Of course deliverable content is something that makes you feel better, but let’s look at what makes the reader feel better about the whole deal and how you can get them there. Do you have a schedule to listen as well? Every great writer listens to their audience. I overheard someone saying that they hated writer’s block. In fact, when I heard it I almost spewed my drink out of my nose! I realized that they weren’t listening. You cannot be sincere in your article writing if you’re not listening to the target audience. There will always be tons of content waiting out there for you, all you have to do is keep your ears and eyes tuned to that location. People will tell on themselves. They will explain their failures, they will describe their goals and where they want to go. Heck, they’ll even give you the tools you need to sell them something! But it will be up to you to craft a piece of content that speaks to them enough to make them want to take action. You will never suffer writer’s block if you turn your ears on every now and then. I love this aspect of my job. Building relationships is something that every content writer needs to be good at. It’s the best part of your content strategy and part of a bigger piece of the puzzle to your success. You can’t stay cooped up in your office pouring over your most recent article and hope that someone will help you share it. You’ve got to get yourself out there, immerse yourself in the sea of people that want and need what you have to say. Coupled with listening, this is the easiest thing to do in your marketing. If you’re listening, you will be seen communicating with others, helping, conversing, and, (gasp!!) even making some friends out there. Building relationships is important for your content because you’re not going to become successful by yourself. In building relationships you will start to build trust in your brand with the people that hang out with you the most. Relationships are worth more than just casual acquaintances because that one person you build a relationship with could have a friend that will see your content later and help you distribute it to millions who need it. Now that’s an effective content marketing strategy. Another way to create an effective content marketing strategy is to always manage expectations of your brand and how it relates to your audience. Don’t oversell yourself or create some persona that you’re superman when you’re only the guy that changes the oil in superman’s car. People have an effective B.S. radar and they’ll find you out if you’re not who you say you are. Isn’t it funny that when the easiest thing to do is to simply be yourself, and yet so many people have a hard time because they want to be like some superstar in their industry? Be yourself. It makes your content more reliable and trustworthy and you will have a better effect when you hit the publish button. Now it’s time to write. It’s no surprise that images affect people more than plain writing does. That’s just how our brain functions. However, as I explained last time, you have to learn to write in pictures in order to sustain an approachable content marketing strategy with your readers. Sidenote: I hate the term writing. While it’s true that’s the action we’re performing before we publish our piece, but in essence, just writing something gets you nowhere. You’re not a writer, but a storyteller, and every storyteller has to create something that dances in the readers mind and persuades them that now is the time to take action. Whatever story you’re about to tell, don’t forget to make the reader the hero. It’s all about them and what they’re trying to do in their business. Help them see the bigger picture in your story and use that to describe how they are going to get there. The moral to this story is that if you are going to create a content delivery strategy that is effective, then you may have to drop some bad habits. You may have to pick up some good ones as well. But never underestimate the power of your content. You’re not a writer, there’s millions of them out there simply…writing. You are a storyteller, and that is the superpower you need to create a deliverable piece of content that will sustain your reader until you hit the publish button again next week. What do you think? 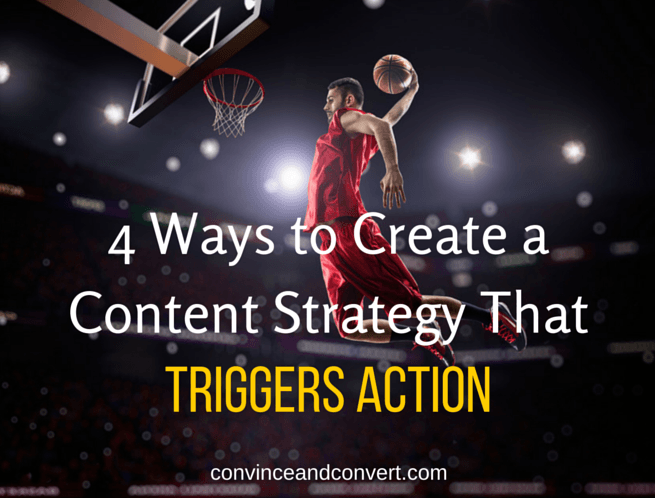 Do you have a great story to tell about building an effective content strategy? Do you have any suggestions for the C&C readers that will help them overcome some obstacles in their marketing?